Spring is in the air, Easter is approaching and that long bank holiday where everyone ends up in the garden centre is mere weeks away. One of the first purchases on many a gardener's mind will be a new best lawn mower. Cutting the grass is a real pain if you’re heaving around a tired old push-along, but it's really rather fun when you're equipped with one of the best lawn mowers (or lawnmowers, if you’re a Brit) money can buy. Specifically, we're talking battery-powered lawn mowers. Throughout the summer your grass gets used more than during the rest of the year so it’s important to look after it, and these types of mowers can help you do so with ease. They're especially good for smaller lawns but that doesn't mean those with larger acreages should turn their noses up. Battery-powered lawn mowers are much more convenient than corded or petrol-powered lawnmowers, and trim your grass just as well. You have nothing to lose yet everything to gain for the health and appearance of your lawn. What is the best lawnmower? We believe in making chores as easy as possible, so we strongly recommend cordless, electric lawnmowers for most garden owners. Our current top pick is the Greenworks G40LM35K2X. The mower's powerful 40-volt battery helps it scythe through 400 square metres of grass on a single 60-minute charge. Impressive, right? But there are plenty of other choices for you to browse through below. For most lawnsmen (lawnspersons? ), we'd now recommend a cordless mower such as the ones listed here. That's because there are few less compatible duos than a 240-volt electric cable and a fast-spinning blade, and with UK garden sizes ever shrinking, petrol mowers are just totally OTT for most people, especially in cities. Standard electric lawnmowers are not only potentially dangerous but they take much longer to cut a lawn simply because of the time spent grappling with the cable. Modern, battery-powered cordless mowers, on the other hand, are as powerful as their wired counterparts, but much easier to use. Their lithium-Ion batteries are relatively quick to charge and provide between 20 and 40 minutes of hassle-free mowing, which is plenty long enough for the average UK garden. The diminutive, keenly priced Greenworks is a top trimmer for smaller city lawns. In our test it performed exceptionally well, collecting every last tuft of turf while leaving a very smooth finish. It comes with a 35cm (14 inches) cutting deck, a 40-litre collapsible mesh grass collector, five cutting heights (20mm to 70mm) and an interchangeable, high-performance 40v Li-ion battery that keeps the freakishly quiet brushed motor running at full tilt right up to the last drop of juice. It’s also a doddle to push around and, at 15kgs, it’s easy enough to carry. I managed to get three separate cuts out of the battery, equating to around 30 minutes of continuous use on a single charge. An excellent alternative to the Stihl below. This new lightweight mower from Stihl is a little cracker and perfect for small urban lawns up to around 60 metres square. Aside from cutting the grass remarkably well – and right to edge – what really stands out is the way its brushless motor operates. Instead of running at full tilt all the time, this mower features a permanent Eco mode that adjusts the speed of the blade depending on the length of grass. Hence, when tackling long stuff, it ramps up to full speed and when it senses little resistance against the blades it backs off to a gentle hum. A system like this not only saves a lot of battery energy – we’re on our fourth cut and the battery’s only half way empty – but it also helps keep noise to a minimum. And believe me, this little fella is so hushed you could probably mow the lawn on a Sunday at 6am and the neighbours would never know. The Stihl is equipped with a small 33cm plastic cutting deck and a 30-litre grass collector that can be unfolded to make emptying a veritable cinch. Its easily adjustable cutting height range of 25-65mm isn’t the best in the pack but it’s perfectly ample for the majority of UK grasses. However, its lowest blade height won’t be close enough for a bowling green-style ornamental lawn, so bear that in mind. It also doesn’t come a battery and charger as standard so expect to dish out another £120, unless you already happen to own another Stihl product that uses a 36v AK20 battery. 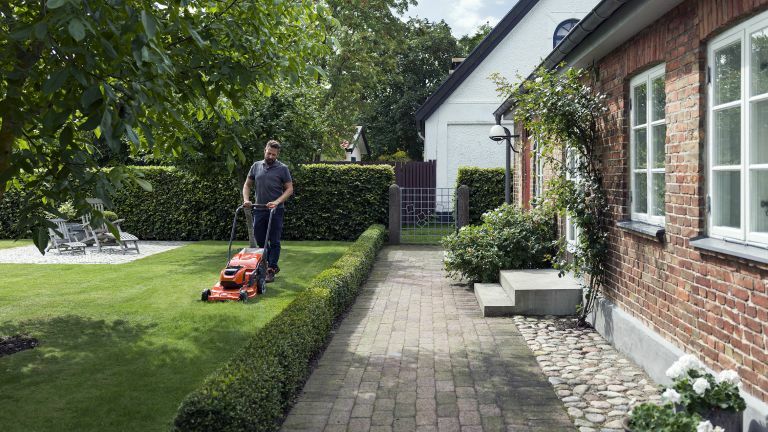 Stihl’s reliability record is second to none – it is, after all, the preferred brand among professional gardeners and landscapers – so chances are this titchy garden devil will last a great many summers. FlyMo’s first cordless model has the narrowest cutting deck on this page (30cm) so definitely consider it if, like most townies, you have a titchy lawn. You shouldn’t have any problems storing it either since it’s not only the smallest folding mower we’ve come across but, at 9.9kgs, it’s the lightest, too. It even comes with a handle for easy lifting. I shoved the convenient height-adjuster down a notch or two and gave the mower a spin in some three-inch grass. The little fella trundled straight through it, snipping here, snipping there without breaking into a sweat and doing a rather good job, despite leaving a few wheel marks in its wake. It also cut pretty close to the edge and was one of only a small handful of mowers quiet enough to not scare the neighbour’s rabbits. The Mighti Mo’s 40-volt Li-Ion battery packs a powerful punch and will allegedly trim around 250m2 of lawn on a single two-hour charge. However, the plastic grass collector is relatively small (30 litres) so expect semi-regular trips to the compost heap. Despite its size, the British-made Bosch Rotak weighs a surprisingly light 13.9kg and is pretty easy to push around. It comes with a comfy Ergoflex handle that is perfect for both righties and lefties. It’s also quite a looker, at least by lawnmower standards. For those with large suburban lawns, this thing passes much muster. Its wide, height adjustable 43cm cutting deck and 50 litre grass collector mean few trips to the compost heap and, because its fitted with extended grass combs, it also cuts right to edge of the lawn. And that means less strimming. The Bosch has also got a clever processor on board that ensures the blades maintain a constant speed through any length of grass, thereby allegedly increasing the 36v battery’s capacity by up to 20%. Even with that boost, the mower still only ran for about 30 minutes for me, but I covered a lot of ground in that time. Impressively, the battery takes less than an hour to fully recharge; enough time for a quick half before heading out again. If you’re feeling flush and have the lawn size to make the most of it, the Bosch is an excellent option. It cuts exceptionally well, is light enough for even Spindleshanks to push around and it has a decent run time. Right, that’s that done; where’s the other half? The Mountfield comes with two whopping 48v Lithium Ion batteries, providing enough charge to cover an impressive 300 metres square or around an hour of continuous mowing. Each battery takes just over an hour to charge and can be used in other Mountfield Freedom48 products. The 500-watt Princess produces a 38cm cut – good for medium-sized lawns – and features a rear roller for creating stripes, a generous 40-litre grass collector, a mulching plug that directs nitrogen-rich grass cuttings back into the lawn and, get this, a push handle that can be adjusted for various heights. Rather usefully, the handle also folds in two making the whole package one of the smallest stowaway units in this roundup. Needless to say, the Mountfield cut the test lawn impeccably well and even handled the longer jungle sections with aplomb. It was also very quiet. Mind you, the flimsy six-position cut-height adjuster lever seems out of place on such a well-crafted unit. The home-grown Gtech Falcon is far and away the coolest looking mower in this roundup. Admittedly, 'coolness' and 'mowing the lawn' aren't the easiest of bedfellows. It's also superbly built and comes with an extraordinarily comfortable gorilla-proof, fold-over handle, a 40-litre mesh grass collector and a gear lever-style cutting-height adjuster. At five hours, this has much the longest charging period on test, but this can be alleviated by splashing a further £99 on a quick charger, which cuts juicing time to an hour. Interestingly, it appears to be exactly the same battery as is used in Gtech's excellent electric bike, so theoretically you could swap between the two, which is unusual to say the least. At 16.95kg, the Gtech is a tad awkward to push up inclines, and it's a little noisy as well. However, its large rubber-coated wheels make light work of the flat stuff and cut our garden pasture remarkably well, leaving no unsightly clumps in its wake. A keenly-priced, solidly-built cracker. This striking self-propelled 40-volt cordless model is just the thing for the lazy owner of a broad sward who can’t be bothered with pushing a mower up and down all day long. Here you simply pull on the wire bar and it moves off, pulling you along – at a fairly brisk pace it must be said. The Cobra has a wide 18-inch (46cm) cutting width, a nice big seven-stage cutting height lever that raises the mower from 25mm to 75mm, a usefully large 60-litre grass bag and the wherewithal to mulch till the cows come home. It also has a charge indicator on the comfy handlebar that lets you know when you’re about to run out of power and, ingeniously, a storage bay for two batteries that automatically change over when the first one reaches depleted stage. You can expect around 30 minutes of cutting time when using the self-propulsion feature. At 29kg, this mower’s quite a heavyweight, so perhaps avoid it if you have steps to negotiate. This bright orange Huskie uses two batteries in sequence which means long stints in the rough. It sports a wide 47cm cutting deck, a large 55-litre fabric grass collector and one of the comfiest handlebars on the sod. At 24kg, this thing is no featherweight so you can forget lifting it on your own. Also, it doesn’t come with any batteries or charger so figure in an extra 270 quid on top of the already steep asking price. The good news is that it mowed our admittedly undersized test lawn impeccably well and with minimal effort. But if the thought of pushing 24kg of orange beefcake up and down the garden doesn’t fill you with much glee, then perhaps dig a bit deeper and opt for the self-propelled LC 347VLi model instead. There's no two ways about it – this green reaper is a monster. It weighs almost as much as a petrol-driven machine but then it does come equipped with a gargantuan 7.5Ah, 56-volt Li-Ion battery, and looks like a powerup from Halo. Also onboard are vari-speed self propulsion and LED headlights for… er, gardening at night? If you have a large lawn to mow and can't be arsed with pushing, then this is the model for you. Its wide 50cm blade scythes through everything with aplomb and keeps on going for up to 35 minutes on a single charge. Recharging takes just 45 minutes. The huge grass collector, meanwhile, ensures fewer trips to the compost heap. The Ego also folds up surprisingly small and can be stored upright, or – if you have the muscles of Hercules and can lift it – on your garage wall.